PCE-P01 is a portable handheld digital differential pressure manometer used to measure differential pressure in pneumatic, compressor and pump installations, valves, tanks and heating, ventilation and air conditioning (HVAC) systems. The PCE-P01 displays min / max / average values right on the meter's screen for comparison against current measurement values. PCE-P05 is a portable handheld digital differential pressure manometer used to measure differential pressure in pneumatic, compressor and pump installations, valves, tanks and heating, ventilation and air conditioning (HVAC) systems. The PCE-P05 displays min / max / average values right on the meter's screen for comparison against current measurement values. PCE-P15 is a differential pressure manometer used to measure gauge pressure and true differential pressure in pneumatic, hydraulic, compressor and pump installations, valves, tanks and heating, ventilation and air conditioning (HVAC) systems. 11 pressure units are selectable for Imperial and Metric measurement, including bar, mmHg, ozin², kgcm², psi, inH2, kPa, ftH2O|, inHg, cmH2O and mbar. PCE-P30 is a differential pressure manometer used to measure gauge pressure and true differential pressure in pneumatic, hydraulic, compressor and pump installations, valves, tanks and heating, ventilation and air conditioning (HVAC) systems. 11 pressure units are selectable for Imperial and Metric measurement, including bar, mmHg, ozin², kgcm², psi, inH2, kPa, ftH2O|, inHg, cmH2O and mbar. The Manometer PCE-DMM 20 has a two-line display. The manometer can represent pressures up to 600 bar, relative or absolute. The parts of the gauge PCE-DMM 20 that come in contact with liquids are made of stainless steel. PCE-P50 is a differential pressure manometer used to measure gauge pressure and true differential pressure in pneumatic, hydraulic, compressor and pump installations, valves, tanks and heating, ventilation and air conditioning (HVAC) systems. 11 pressure units are selectable for Imperial and Metric measurement, including bar, mmHg, ozin², kgcm², psi, inH2, kPa, ftH2O|, inHg, cmH2O and mbar. PCE-910 is a portable handheld digital differential pressure manometer, meter or gauge used to measure differential pressure in pneumatic, compressor and pump installations, valves, tanks and heating, ventilation and air conditioning (HVAC) systems. The PCE-910 features a dust-proof, splash-resistant housing, allowing the meter to be used under adverse conditions. PCE-917 is a portable handheld digital differential pressure manometer, gauge, or meter used to measure differential pressure in pneumatic, compressor and pump installations, valves, tanks and heating, ventilation and air conditioning (HVAC) systems. The PCE-917 features a dust-proof, splash-resistant housing, allowing the meter to be used under adverse conditions. The manometer PCE-DMM 21 is suitable for flush sanitary installation. The manometer may represent on its rotatable display pressures up to 40 bar, absolute or relative. The filling of the manometer has a food safe FDA approval. The flush mounting of the manometer can be sterilized. The manometer PCE-DMM 60 is a precision instrument of the highest standards. The manometer is specifically designed for process monitoring and calibration. This manometer is distinguished by its modular concept. This means that the actual sensor and the display can be separated. 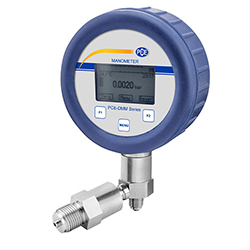 The pressure transmitter can be selected on site for different measuring ranges and connected to the display without tools. The manometer PCE-DMM 70 is a precision instrument for leakage testing. The manometer is specifically designed for leak testing of pipe networks. The actual manometer and the display of this precision instrument can be separated without tools. The measurement values are stored in the internal memory. While the original manometer was a liquid column gauge, today's manometers employ many different methods of pressure measurement. For example, a flanged manometer is a pressure gauge that normally uses a round diaphragm or spring clamped between two flanges to measure pressure. Other pressure gauges use electronic pressure sensors based on piezoresistive strain, capacitive, magnetic, piezoelectric, optical or potentiometric measurement principles. Pressure measurements can be expressed in a number of different measuring units, depending on industry, application and regional preferences. Following is a conversion table depicting some of the more commonly used pressure measuring units. What kind of manometer do you need? Ask yourself the following questions to help identify the right manometer product for your application. What kind of material will be measured? When choosing a manometer, it is important to consider the nature of the material to be measured. Is the material a gas or a liquid? Is the material abrasive or acidic? Is the material corrosive or explosive? The nature of the material helps narrow down the selection of manometer products to only those compatible with the specific kind of material. For example, the type of membrane or diaphragm used in a flanged manometer or pressure gauge determines the gauge’s compatibility with certain kinds of liquids or gases. Ceramic diaphragms are highly resistant to process fluids with abrasive particles, but ceramic diaphragms can be incompatible with strong acids. Whereas stainless steel diaphragms are easy to clean and sterilize, and thus frequently used in the hygienic processing of food and pharmaceutical products. The technical specifications of each manometer device will outline any compatibility requirements, so be sure to review the specifications carefully before purchasing. Safety note: PCE Instruments (PCE) offers manometer products for measuring the pressure of air, gas and liquid. However, for safety reasons, it is strictly prohibited to conduct measurements of corrosive or explosive materials with any of the manometer products found on this website. What type of pressure should be measured? Absolute pressure references zero pressure or a perfect vacuum. Absolute pressure commonly is used when measuring air with an altimeter or barometer. Relative pressure references ambient air pressure or atmospheric pressure. Relative pressure is divided into overpressure and negative pressure. If the ambient air pressure is 0 bar, for example, pressure measurements above 0 bar are considered overpressure, while pressure measurements below 0 bar are considered negative pressure. In practice, manometers are most commonly used for the determination of relative pressure. Differential pressure references the difference in pressure between two points. Differential pressure manometers are often used for comparative measurements. For example, an HVAC contractor might compare the difference in air pressure before and after a filter to determine whether or not the filter is soiled and needs to be replaced. What are the mobility needs of the application? Will measurements be taken in multiple locations or just one? In other words, does the manometer need to be portable or stationary? PCE carries a variety of portable or handheld manometer devices and a wide selection of fixed, built-in or stationary manometer pressure gauges. Portable manometers are ideal for use in the field as well as the laboratory. For example, a portable manometer can be used to check pipe pressures in multiple pump houses located throughout a municipality. 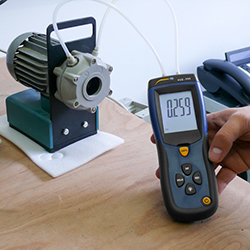 A handheld differential pressure manometer can be used in a quality control laboratory to test air filters to ensure the filters interfere minimally with HVAC system performance. PCE's portable or handheld manometers are typically digital battery-powered devices with added functionality such as the ability to store minimum and maximum values or to record measurements over a period of time. Those manometers with data-logging capabilities often feature an SD card memory, USB port or RS-232 interface to transfer data to a PC for detailed analysis and reporting. Stationary manometers are ideal for continuous monitoring. Because of this, stationary manometers are heavy-duty pressure gauges built to withstand daily use in harsh industrial environments. Stationary manometers can be digital or analog. Digital manometers that are stationary have large, easy-to-read LCD screens that clearly display measurements in real time in pressure units such as bar, psi, Pa, etc. Some stationary digital manometers also have an analog output configurable as 4 ... 20mA or 0 ... 10V. These stationary digital manometers are differential pressure sensors often used in control technology. Analog manometers employ mechanical measuring methods; therefore, analog manometers or pressure gauges require little to no maintenance. Because there are no electronics, analog pressure gauges are quite easy to use. An analog pressure gauge simply gets screwed into the pressure system and the pressure measures can be read from the analog display. Typically, stationary manometers have different connections or threads. Depending on the device, up to 6 different threaded connections can be available, e.g., G½" DIN 3852 or ¼" NPT. When purchasing a threaded manometer or pressure gauge on this website, you can select the desired connection from a dropdown menu to configure the product for your use. What measuring range and accuracy are required? Other important criteria when selecting a manometer are measuring range and accuracy. It should be noted that the anticipated pressure measurement should fall within the middle third of the manometer's display range. PCE's stationary pressure gauges have measuring ranges from 0.1 to 600 bar with accuracy classes of 0.05, 0.1, 0.2 and 0.5. PCE's handheld pressure gauges can measure pressures of +/- 1000 to +/- 7000 mbar with an accuracy of 0.3% or 2%. If you have any questions about the manometer products found on this website, please contact the friendly and knowledgeable technical support staff at PCE at or +44 (0) 2380 987 035 for PCE Instruments UK, or at or +1 (561) 320-9162 for PCE Americas Inc.